Proprietary Name: She Xiang Zhuang Gu Gao Regular What is the Proprietary Name? 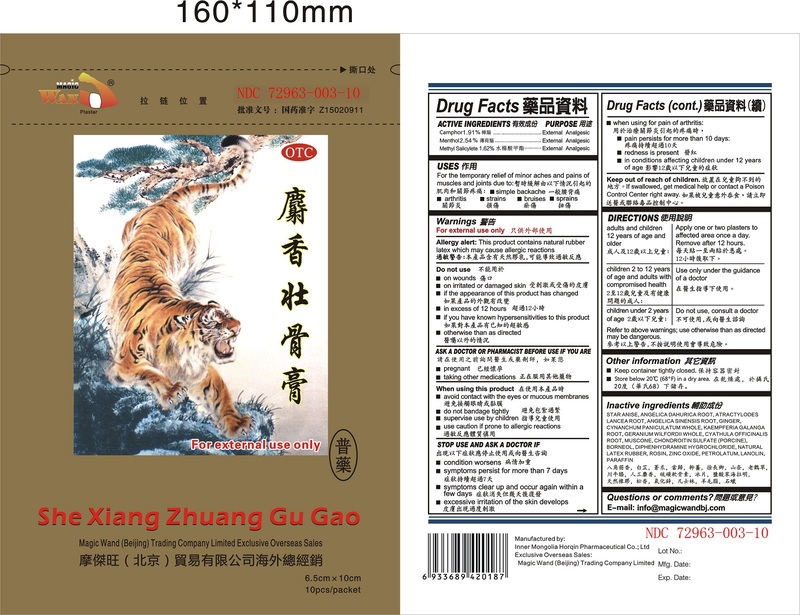 She Xiang Zhuang Gu Gao Regular with NDC 72963-003 is a a human over the counter drug product labeled by Inner Mongolia Horqin Pharmaceutical Co., Ltd. The generic name of She Xiang Zhuang Gu Gao Regular is camphor, menthol, methyl salicylate. The product's dosage form is plaster and is administered via transdermal form. Dosage Form: Plaster - Substance intended for external application made of such materials and of such consistency as to adhere to the skin and attach to a dressing; plasters are intended to afford protection and support and/or to furnish an occlusion and macerating action and to bring medication into close contact with the skin. For External Use only.Allergy Alert: This product contains natural rubber latex which may cause allergic reactions. Adults and children 12 years of age and older: Apply one or two plasters to affected area once a day. Remove after 12 hours.Children 2 to 12 years of age and adults with compromised health: Use only under the guidance of a doctor.Children under 2 years of age: Do not use, consult a doctor.Refer to the above warnings: use otherwise than as directed may be dangerous. Keep container tightly closed.Store below 20ºC (68°F) in a dry area.